Behind this tech are some essential building blocks. And the vendor of one of those, a key component in the touchscreen, has some news next week. Photo (CC-BY) Ken Hawkins. Let’s do some quick math: put together the first maker of a consumer multi-touch product (also the first real multi-touch music product), and one of the world’s biggest suppliers of touch tech, who sells to companies like Apple. Mark your calendar for the first of June. That adds up to … something, definitely. So, when a publicity rep for Stantum points CDM to teaser news, we take note. And yes, that means an official announcement is coming the week before Apple holds its WWDC keynote, which should at the very least add some drama (and will no doubt over-excite Apple watchers). Notably, the same company is a supplier to Nintendo (E3 is about to launch), and companies like HP and Motorola (think non-iPad tablets). This could wind up being relevant to all of those products. It’s not clear whether this will figure into next week’s product, but “touch and write” has been Stantum’s watch cry of late. Photo courtesy Stantum. 2. More responsive performance (lower touch sensor latency, in particular). 3. Pressure sensitivity. Some sensors actually read this sort of data, but they aren’t typically a standard part of the touch suite because of reliability issues – even on the iPad. It’s an area in which sensors could improve. 4. While I don’t expect it from the Stantum announcement – at least, they haven’t talked about it as an area of research or interest – tactile feedback is a clear area for exploration. Stantum is the Bordeaux, France-based multi-touch research firm; they created the Lemur multi-touch display, which went on sale in 2005 and was used by artists like Bjork, and they’ve been developing touch tech ever since. While the Lemur is well known to computer musicians (and now available as an app on iPad), it generally flew under the radar of the tech world. But it really was the first generally-available consumer multi-touch display product, at least in the form we now know it, years before the introduction of the iPhone. “Nissha Printing, Ltd.” may not sound like one of the world’s leading technology makers, but they are. They’re involved in digital printing, but they also make everything from molds to films to, crucially, touch input tech. (Think about what a touchscreen’s most essential part is: it’s a thin, printed film, photographic printing reimagined for a digital age.) And Nissha are no small player in this market; they’re a huge global player who supply, according to company documents and Wikipedia Japan, GM, Nokia, HP, Nintendo, and, yes, Apple. They’ve been in the business since immediately after World War II, tracing their founding back to 1929. Stantum says the announcement will be an “industry-changing technological advancement”; Nissha says that they believe it will “significantly impact the market.” Now, of course, people always say these darned things in press releases, but Nissha is actually big enough that it could be. This also coincides with Apple’s developer keynote on the 11th of June. That could mean technology involved in an Apple product (though it’s atypical for such a thing to happen before Apple’s announcement), or it could be a PC-sector product with those companies hoping to steal some Apple thunder by getting out first. Or it could be both: Apple may have quietly integrated the core technology into their own, industry-beating design and supply chain engine, for an iOS and/or Mac product, as other PC and consumer electronics makers scramble to work on their own products. From the essential microprocessor to camera sensors to displays, we’ve already seen Apple integrate technologies as they’re hitting the rest of the industry, so it’s not unheard of for these things to coincide. What it might be: The best clues as to what to expect come from Stantum. Their tech lists a number of advantages, including passive input (from objects, especially pens), simple physical implementation (which can allow devices to be thinner, argues DigiTimes), immunity to EMI from wireless systems, pressure sensitivity (something missing on iPad and iPhone), and high responsiveness. We licensed the technology to tier-one semi-conductor companies such as ST Microelectronics to embed our multi-touch know-how into dedicated chips. We also teamed up with some of the largest and most trusted touch panel makers to bring our solution onto the consumer market place. At JazzMutant/Stantum, we’ve always considered the multi-touch technology as a milestone, not the final destination. The responsiveness of a touch system is the most under-estimated parameter, even though it tremendously influences the perceived usability, transparency and trustworthiness of an input device. This is why a vast majority of Multi-touch systems available fails to meet music makers’ expectations. 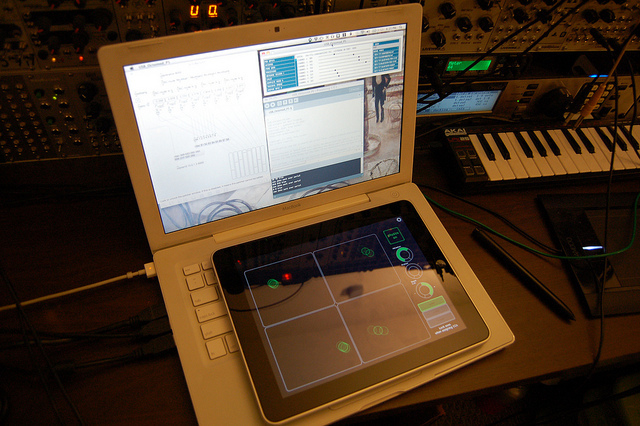 The Lemur app, now on iPad, at the heart of a music studio. Hey, is that this thing called a “pen” next to the iPad? Interesting. Photo CC-BY-SA) George P. Macklin. Why music matters (again): Musical applications remain some of the most sophisticated proving grounds for touch interfaces, covering the gamut from writing music notation – hello, Ludwig van Beethovens of the world – to wild, new, touch interfaces that embody real-time expressivity at the most human level. Music applications also were among the first touch experiments in research and consumer products, including the ground-breaking Lemur. And Stantum has special competency in that area. Also, Stantum has told Create Digital Music in interviews to keep an eye on what they’re doing. And all of this is why Apple will introduce a 7″ iPad at WWDC. Joking. Seriously, I’m just joking. In fact, even the rumor mill appears to peg any new iPad for fourth quarter, not June. 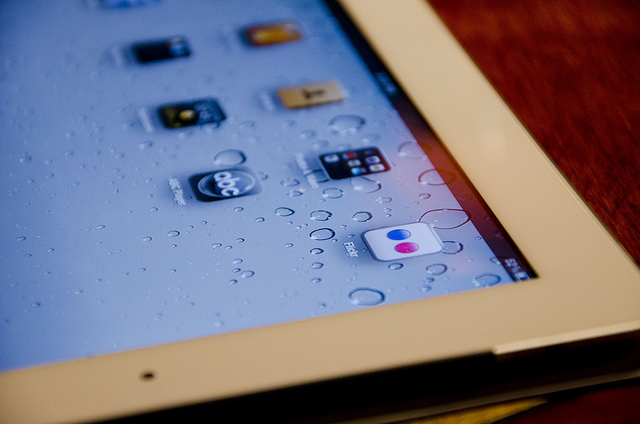 I think, though, it’s not any particular iPad that matters – it’s the ongoing evolution of the technology. Apple has done a great job of being on top of that and making usable, ground-breaking designs. It’d be great to see some of their competitors earn some hits, too. 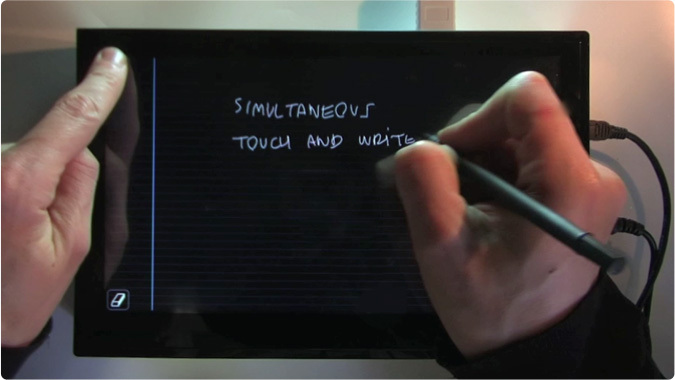 Either way, what those hardware and software makers use depends on the advancement of the underlying technologies, the ones that connect your fingers (and pens) to the machine and make the results visual and expressive. Seeing what happens next could be great. We’ll be watching.